Not quite Europe, not quite Asia - Azerbaijan, the land of fire, is a one-of-a-kind destination that refuses to be pigeonholed. From the medieval streets of Sheki to dazzling 21st-century architecture in Baku, bubbling mud volcanoes in Gobustan to the Silk Road village of Lahij, it’s a land that will both inspire and amaze. When combined with a visit to Georgia, home to some of the most dramatic landscapes in Eastern Europe, you have all the makings of an unforgettable journey. 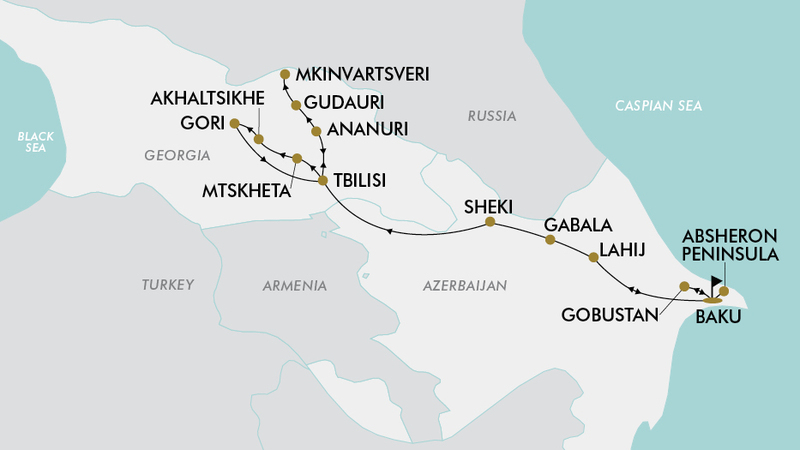 Discover the highlights of Azerbaijan and Georgia on this 14-day tour of Baku, Tbilisi, Sheki and beyond. Be surprised by the contrast of old and new in beautiful Baku; take in the UNESCO-listed Maiden Tower and Shirvanshahs Palace; wander through the cobbled streets of the charming old town; and delve into the country’s intriguing past at the National Museum of History. Visit Yanar Dag on the Absheron Peninsula, where a natural gas fire has blazed for over 60 years; see the mud volcanoes and 6,000 year old rock carvings of Gobustan; and admire incredible mosaics and stained-glass windows of Sheki. Cross the border into Georgia and explore ancient Sighnaghi town, overlooking lush green vineyards; visit the UNESCO listed churches of Mtskheta, the ancient capital of Georgia; explore the rock-hewn monastery of Vardzia; travel by 4x4 vehicles to Gergeti Holy Trinity Church, and more. This once-in-a-lifetime tour includes return international flights, 11 nights 4 to 5-star accommodation, English-speaking guides and more - the only thing missing is you. Today depart Sydney, Melbourne, Brisbane, Adelaide or Perth for Baku, Azerbaijan. Fly with award-winning Qatar Airways (subject to availability). Upon arrival, you will be greeted at the airport and transferred to your hotel in Baku. After breakfast, embark on a Baku city tour with your local guide. Enjoy a panoramic view of Baku city and bay from Highland Park. See Martyrs Alley, a cemetery and memorial in Baku, and a marvellous view of Flame Towers, a famous trio of skyscrapers in the city. Later, visit the Old City - the most historical part of Baku. Walk through the narrow cobbled stone streets, visit the fortification tower, Caravanserai complexes, the UNESCO listed Maiden Tower, and Shirvanshahs Palace - one of the pearls of Azerbaijan's architecture. The tour then continues to Nizami Street - a large pedestrian and shopping street in downtown Baku before visiting the National Museum of History of Azerbaijan (entrance included). Weather permitting, you will have the opportunity to join a boat tour on the Caspian Sea admiring the beautiful seaside boulevard. Today enjoy a sightseeing tour of the Absheron Peninsula. See the Ateshgah, the Fire Worshippers Temple; the Qala Archaeological and Ethnographic Museum Complex; and the Ramana Tower, which dates back to the 12th century (entrance not included). Continue to the otherworldly Yanar Dag (Fire Mountain), where a natural gas fire blazes continuously, followed by the Oil Derrick Forrest and the Heydar Aliyev Centre (entrance not included) - designed by the late Iraqi-British architect Zaha Hadid. In the late afternoon return to Baku. Today visit the Gobustan National Park, a UNESCO world heritage site. On the way, stop to view remarkable mud volcanoes, formed by the eruption of mud, water and gas from below the surface. Arriving at the Gobustan National Park, take time to admire the ancient rock carvings, which depict primitive people, animals, battle-pieces, ritual dances and much more. The park has more than 6000 rock carvings which date back to anywhere from 5,000 to 20,000 years ago. On the way back to Baku, visit the Bibi-Heybat Mosque - a modern re-creation of a famous mosque of the same name which was built in the 13th century and later destroyed by the Bolsheviks in 1936. Today head to the ancient city of Gabala. En-route visit the 15th century Diri Baba Mausoleum in Maraza. Continue to Juma Mosque and the Mausoleum of Yeddi Gumbez in Shamakhi city. Next drive through Girdimanchay River canyon to the historic village of Lahij, where you will see the workshops of blacksmiths, potteries, carpet weaving shops and more as you walk through the cobbled streets. Lahij was one of the main points on Great Silk Road. The tour then continues to Nohur Mountain Lake in Nohurgishlag, before visiting the Tufandag Mountain in Gabala, where you will have the opportunity to ride in a cable car and enjoy breathtaking views. After breakfast, continue to Sheki on the southern part of the Greater Caucasus mountain range. On the way stop at the Chotari Albanian Church and Udi house in Nij village. Upon arrival into Sheki, visit the Kish village and the first church of Caucasus. Then continue to the Old Sheki (entrance included), where you will explore the medieval fortress, The Palace of Shaki Khans, the Historical Museum, and the Round Temple (entrance not included). Afterwards you will have the chance to join an arts and crafts workshop, creating traditional handicrafts. Following breakfast, head to Lagodekhi, the border passage to Tbilisi, Georgia. Along the way stop at the village of Bodbe and see the monastery complex of St. George and the grave of St. Nino that brought Christianity to Georgia. Afterwards, arrive in Sighnaghi and wander through the ancient town, perched atop a ridge overlooking the Alazani Valley. Here you will enjoy a Georgian wine tasting and cooking class at the Javakhishvili Winery. In the late afternoon you will arrive into Tbilisi, the capital city of Georgia. After breakfast, embark on a tour of Mtskheta, a UNESCO listed site which was the ancient capital of Georgia. Visit the Svetitskhoveli Cathedral (1010-1029), which is the burial place of many Georgian kings and historical relics. Stop for lunch at the famous Salobio Restaurant to enjoy traditional Georgian cuisine. After lunch, take in the sights of Tbilisi on a guided tour. Visit the old town and historic centre of Tbilisi, located at the foot of Mount Mtatsminda. Almost all buildings in the Old Town are historic sites; this part of the city buzzes with energy around the clock. Here artists often exhibit paintings and artisans sell their wares. You can admire the Tbilisi architecture, which is characterised by narrow streets, galleries and carved wooden balconies. During the tour you will also see the Mechetian Church, Narikala Fortress, Sioni Cathedral, Anchiskhati Basilica of St Mary, and ‘Sameba' Holy Trinity Cathedral, the main Cathedral of Georgian Orthodox Church. Continue today to Vardzia. Along the way stop at Borjomi, a town famous for its mineral water, where you can have a drink from the spring. Afterwards, arrive in Vardzia, a cave monastery complex where around 600 buildings including churches, chapels, pantries, baths, libraries are carved into the mountain face. Here you can see the remains of preserved secret passages and ancient plumbing and irrigation systems. The site of Vardzia represents the Golden Age, and it is said that thousands of monks have once lived there. In the evening, arrive in Akhaltsikhe. Following breakfast, visit the recently reconstructed Akhaltsikhe Fortress. Inside the complex is a mosque, catholic church and monastery of the Benedictine Sisters, a synagogue, and an Armenian church. Afterwards continue to the city of Gori, built by King David the Builder in 1089-1125. The birthplace of Joseph Stalin, your visit will take in the Stalin Museum (entrance included) before returning to Tbilisi. This morning depart to Stepantsminda (Kazbegi). On the way admire the picturesque Ananuri fortress located above Aragvi River. You will also get to see the amazing beauty of Zhinvali reservoir. In Kazbegi, travel by 4x4 vehicles to visit the Holy Gergeti or Trinity Church, located 2170m above sea level. Weather permitting, you will be treated to stunning views of Mount Kazbeg (5147m), a dormant stratovolcano and one of the highest peaks in Georgia. Return to Tbilisi and enjoy a traditional Georgian farewell dinner and show at a restaurant. Following your breakfast at the hotel this morning, take some time to explore Tbilisi at leisure before being transferred to the airport for your return trip home. For solo travellers a mandatory single supplement of $580 applies. Sydney, Melbourne, Brisbane, Adelaide or Perth. - Baku, Azerbaijan (Pre Tour): $110 per room (including breakfast). - Tbilisi, Georgia (Post Tour): $170 per room (including breakfast). Minimum group size 10, maximum group size 50 per vehicle. The climate is temperate with a marine influence therefore a constant marine breeze. There is a great range in temperatures; the winters are cold and even somewhat rigorous in the mountains, summers are hot and the other seasons are quite marked too. - In September, weather conditions in Azerbaijan make it a medium trip destination. The average temperatures you'll face in September would be between 19.0°C and 27.0°C. - In October, weather conditions in Azerbaijan make it a good trip destination. The average temperatures you will face in October would be between 13.0°C and 19.0°C. - In November the average temperatures you'll face in November would be between 7.0°C and 12.0°C. It has a humid subtropical with considerable continental influences. The city experiences very warm summers and moderately cold winters. Because the city is bounded on most sides by mountain ranges, the close proximity to large bodies of water (Black and Caspian Seas) and the fact that the Greater Caucasus Mountains Range (further to the north) blocks the intrusion of cold air masses from Russia, Tbilisi has a relatively mild microclimate compared to other cities that possess a similar climate along the same latitudes. The average annual temperature in Tbilisi is 13.3 °C. In September the average temperature will be between 26°C to 15°C, October will be 20°C to 10°C and November 13 °C to 5°C. Gratuities (tips) are not included in the tour price for services of the tour leader (when available) and driver throughout the tour. The recommended tip for the tour leader and driver is $3 USD (approx. $5 AUD) per person per day, which will be collected whilst on tour. A tourist visa is a strict requirement if travelling to Azerbaijan on an Australian passport. However, a tourist visa is not required in Georgia if travelling on an Australian Passport.